Hello dear friend, just a note from me asking for your prayers.I will be in the hospital for a few days, the DR. Thought that I might have had another tia, they are running lots of tests to determine the cause of my symptoms. DH and I thought it was exhaustion but after a week of rest, with me not rested and not feeling better ,we felt like it was time to call the dr. Here's what happened, my primary dr was on vacation, I was told to go to the ER, I called my in town neurologist, and found that he had passed away, (shock) I then called my neurology surgeon in Raleigh, they advised me to go to the ER asap. So we did, I was taken back immediately to try and stabilize my bp, later admitted, and now the wait begins. I have been stabilized after 24 hrs. Just waiting for more tests and results. Please pray specifically for great results on my test, wisdom from the DRs. On what protocol to go with. And that God's peace will continue to rest on me and my family., as this has been so unexpected for us. Philippians 4:6-7 be anxious for nothing, but in everything,by prayer and supplication, with thanksgiving let your requests be made known to God. Written by Sue, Saturday, July 28, 2018 Hot , very humid, 90's with scattered showers. As this week is coming to an end, I must say it has been so nice to have this break. It was so overdue!I had no idea how exhausted we were. I even had my weekly house cleaning taken care of by DD. When finished cleaning she suggested putting hair color on my hair, informing me that it was that time again. Susan was so pleased with the results she said she wished we had taken a before. Ha Ha I said "no thanks"! We are so thankful and proud of her, she not only has a degree in Cosmetology, but a BSN, and working on her Masters. So what have I/we been doing, spending as much time with Jack, he is not doing well, lately has had many visits to the vet. I should have written a book(post) on how he came to live with us. He needed us and we needed him, I am not yet ready to say "goodby." He has an appetite, which is a good thing. Like me, old age is catching up. We have been spending lots of time together, talking, making plans, cooking and eating. He is not only my husband, but best friend, we still finish each others sentences. Dinner this evening, all grown on the farm except the chicken. We are truly blessed. Along with getting plenty of rest, we are drinking lots of infused water, water is so important to our health and well being. If I get a headache, or feel lethargic, I start drinking lots of water and before long it's gone, and I am energized. Written by Sue, Wednesday, July 25, 2018, thunderstorms, temps. 80's somewhat humid. My! how summer is passing, I have finished most of my canning, just a few Lima beans and I will be done until fall when the grapes and apples are ready. This gives me a break to finish some projects and much needed gardening, which I truly enjoy!My roses have done so well this year. This is one of them, isn't it pretty, I wish I knew the name. 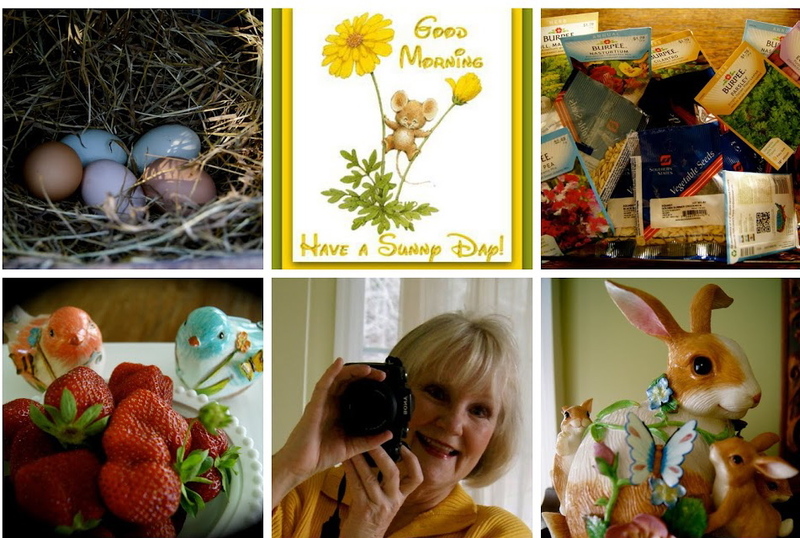 Dh and I decided we would take a wee break this week, and do what ever we wanted, which we have been doing each day, sleeping a little later, lingering over devotions on the porch, and over breakfast. 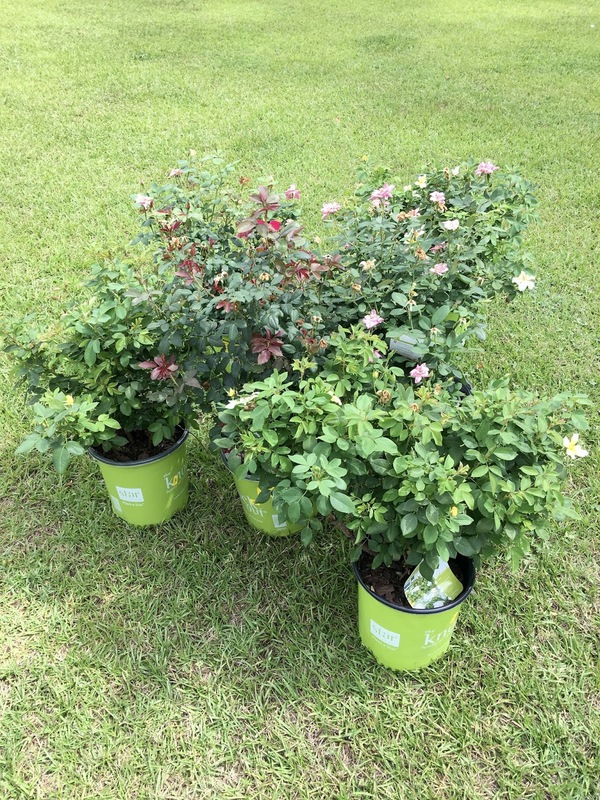 We have also been doing a little shopping at two of our favorite stores, Lowe's where we found this great deal,(half price) on double knockout roses, there are 6 more in the car. 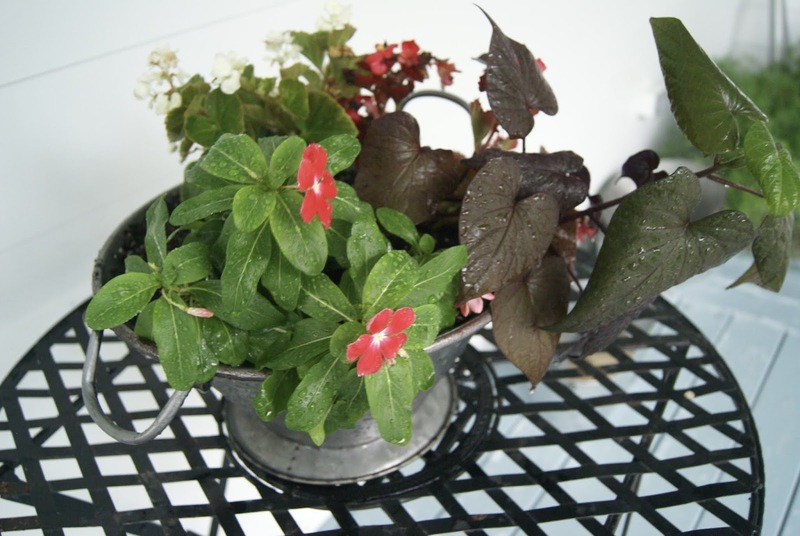 and Tractor Supply where I found these lovely planters, also half price. 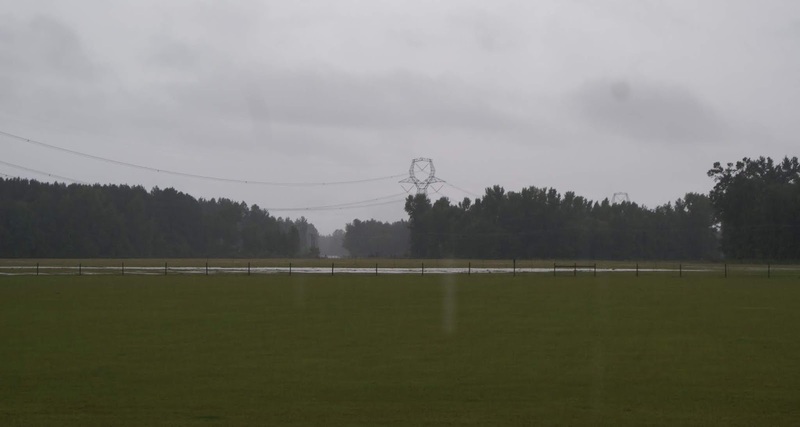 We are also getting some much needed rain today with cooler temps., still humid though. I took these photos at about 5 p.m. today, the soil will be perfect for planting the rose bushes tomorrow. Result after 2 1/2 inches of rain., maybe the roses will get planted. Very seldom do we get days this time of year with low humidity, and temperatures in the 80's. Yesterday was the beginning of such blessings which will take us through Wednesday! I am so enjoying this break as we have had an extremely hot spring and now an even hotter summer. When you have to work outside in extreme conditions like we have had, it can take a toll on your body. Last week as I was walking (very early), I really began to pray in earnest about our weather and asking for some rain and relief from the heat, which brings me to my thoughts for today. I recently read in my devotional about prayer and how we should pray, the writer made the point that there was a big difference between general prayers, and specific prayers, and that most times people pray general prayers, he emphasized the importance of specific prayers. I thought long and hard about this, and asked myself, 'how many times did I pray general prayers,' such as 'God bless so and so', I decided that I would begin to pray more specific prayers when praying for family, friends, or someone, our country, our president. I also wondered as to why general prayers are prayed more often than specific prayers, the reason I believe, is, it takes more time. We live in such a hurry up world today, there just doesn't seem to be enough hours in the day to complete all that needs to be done. Since this devotion, I have found that my prayer life has become more meaningful, and that I am really thinking more intently about people's need and situations, I can pray anytime and anywhere, God never sleeps and His ears are always tuned to our voices. How awesome is this!!! !